Published: Oct. 21, 2018 at 11:55 p.m.
Kareem Hunt of the Kansas City Chiefs first of three touchdowns leads the Kansas City over the Cincinnati Bengals. Dive into the Top 10 Photos from Week 7. 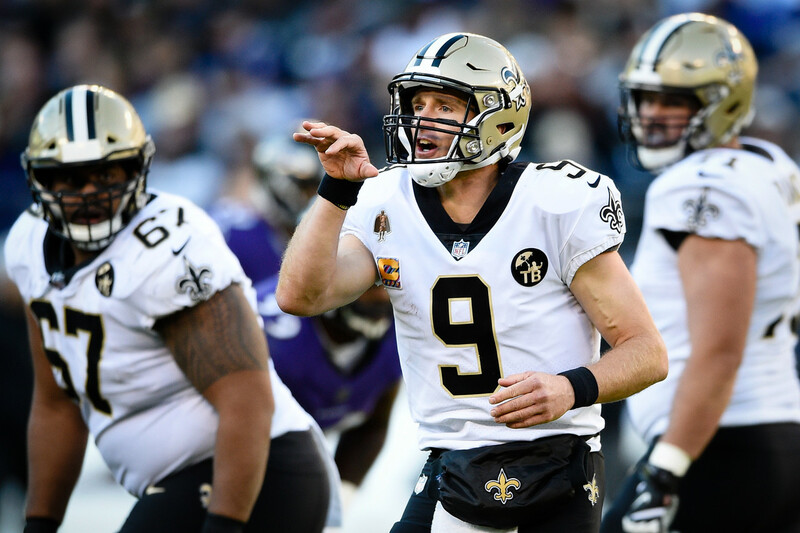 New Orleans Saints quarterback Drew Brees (9) directs his teammates before running a play in the first half of an NFL football game against the Baltimore Ravens, Sunday, Oct. 21, 2018, in Baltimore. San Francisco 49ers defensive end Cassius Marsh (54) celebrates after a sack during the first half of an NFL football game against the Los Angeles Chargers on Sunday, Oct. 21, 2018 in Santa Clara, Calif.
Washington Redskins free safety D.J. Swearinger (36) dances during his introduction before an NFL football game against the Dallas Cowboys, Sunday, Oct. 21, 2018 in Landover, Md. Jacksonville Jaguars wide receiver Dede Westbrook (12) is stopped by Houston Texans defensive back Justin Reid (20) during the second half of an NFL football game, Sunday, Oct. 21, 2018, in Jacksonville, Fla.
Carolina Panthers quarterback Cam Newton kisses the pylon after tripping over it while celebrating a touchdown pass to tight end Greg Olsen (not pictured) during the second half of an NFL football game against the Philadelphia Eagles, Sunday, Oct. 21, 2018, in Philadelphia. Los Angeles Chargers quarterback Philip Rivers (17) joins other players in prayer after an NFL football game against the Tennessee Titans at Wembley Stadium in London, Sunday, Oct. 21, 2018. The Los Angeles Chargers won 20-19. Philadelphia Eagles tight end Zach Ertz, right, makes a catch against Carolina Panthers free safety Mike Adams during the first half of an NFL football game, Sunday, Oct. 21, 2018, in Philadelphia. Minnesota Vikings running back Latavius Murray (25) celebrates after rushing for a 38-yard touchdown during the second half of an NFL football game against the New York Jets, Sunday, Oct. 21, 2018, in East Rutherford, N.J.
Los Angeles Chargers cheerleaders line up before an NFL football game against the Tennessee Titans at Wembley Stadium in London, Sunday, Oct. 21, 2018. Kansas City Chiefs running back Kareem Hunt (27) dives for a touchdown during an NFL regular season game against the Cincinnati Bengals on Sunday, Oct. 18, 2018 in Kansas City, Mo.